Starting at sunset tonight marks the first night of Hanukkah! Eight days and nights follow to observe this traditional Hebrew holiday until nightfall on December 14. Like any other holiday, Hanukkah is celebrated with many festive foods, songs, games, and traditions. These traditions, however, are usually shrouded in some mystery for non-Jewish individuals since Hebrew terms can often mask the meaning. I’m here to give some clarity to Hebrew terms that are used a lot for this popular Jewish holiday. Main courses, candy, and other treats are a part of the Hanukkah celebration. Here’s a breakdown of traditional, Jewish dishes and other tasty edibles. 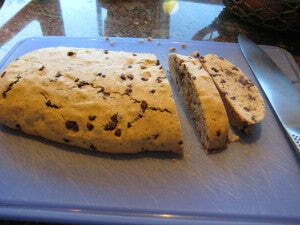 Rugelach—pastries with different ingredients used for the filling, such as raisins, walnuts, cinnamon, or chocolate. Along with tasty foods, Hanukkah is a cheerful time made for joyful singing of holiday songs. It’s tradition to sing songs after the candles have been lit. Here are some of the songs to sing. There’s also, of course, the very popular Dreidel Song (which requires no translation either). Speaking of Dreidels, games are a big part of Hanukkah traditions as well. What you may not know is that there’s much more to a Dreidel than a spinning top as many non-Jewish people assume. 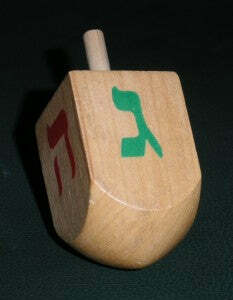 But, with four different Hebrew symbols on each side, the Dreidel can actually be played as a gambling game. Hanukkah’s main tradition, of course, is the lighting of the candles. 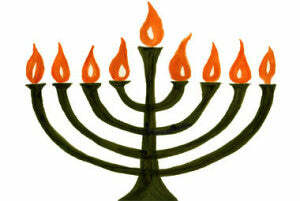 The nine-branched candleholder is often times incorrectly called a menorah, but is rightly called a Hunukkiah. The menorah only has seven candleholders—like the lamp that was used in the ancient holy temple in Jerusalem. Shammash—found on the Hanukkiah, but not the Menorah, Shammash translates to ‘server’ as it is the flame that feeds each candle. Have a wonderful time celebrating these eight miraculous nights and, as always, thanks for reading. Happy Hanukkah!